Let Life Organize Itself – Love. Life. Practice. As a follow-up to my previous post, which dealt with evaluating your habits before you decide to change them, I’d like to talk about self-organizing processes. Specifically, let’s take the same principle from the level of individual habits and up to the big picture. Your environment is the result of innumerable factors that combined to put you where you are, and those factors are all changing, disappearing and appearing every moment. Might it be smarter to sit back and let life organize itself into the way things should be? However, a practicing Taoist might reflect that seas have both storms and calm, and that if you simply are a clever sailor and ride out the waves they will actually end themselves. Rather than fight the waves, the smart sailor cultivates the skill of navigating them, because she recognizes that every calm is the prelude to another storm. It’s not magic. It’s setting up a system that has the essential elements of time, space, and passionate people, and then just stepping back and letting it work. For beginning facilitators, that “stepping back” is the hardest part. In fact, in the guidebook Harrison Owen recommends you deliberately stick your hands in your pockets or go for a coffee, because if people are hesitant to put something on the wall the natural urge is to encourage them, or set an example, or call on someone. It is absolutely essential that the facilitator do nothing. My mentor, Lisa Heft, told me once of a long three-minute silence that seemed to drag on forever. Eventually, though, people realized that nothing was going to happen unless they moved…and gradually the wall filled with sessions. That is always what happens, if the facilitator has enough patience to let it. And the process of letting people create the day through their agenda rather than the agenda creating the day for the people – that makes incredibly magical events. The funny part for facilitators, that we talk about with each other in puzzled tones, is the clients who come to us either before or after and say “But…how can a bunch of people just organize themselves?” The answer, of course, is simply this: how could they do anything else? At any “regular” conference the agenda is not an inevitable force moving people; they have to decide to attend classes, speeches, etc. Usually they do, through the clever process of not making anything else readily available. But most people who regularly attend conferences have at least one example of a side conversation, a coffee break, a chance meeting in the hall that turned into an immensely productive and beneficial learning experience. That’s self-initiated, coming out of the confluence of time, space, and opportunity. The entire world of humankind is self-organizing, Harrison would say, whether it knows it or not. 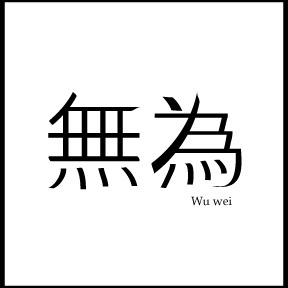 The idea of wu-wei is not one of laziness or procrastination. It’s more like a libertarian view of personal development: just as much work as necessary, and no more. Rather than learning what to do next, you learn when to stop doing. You learn how to create the time and space in your life for the opportunities to present themselves. This is anathema to most productivity methods. There is an entire school of thought which says you must constantly be doing, hustling, that nothing will be given to you unless you go out and take it. It’s an interesting philosophy, and entirely at odds with reality. By their very existence, everyone alive has had something given to them – whether that’s nourishment and shelter as an infant or a scholarship to a college or the chance to excel past their disadvantages. If you can accept the reality that life is far more complicated than it’s possible to comprehend, it follows that any system that claims to “organize” or “make sense of” life can only do so by ignoring vast quantities of facts and processes. That’s fine; it is, in fact, part of the process of your life organizing itself into the life you want. But it’s possible that you’re making that process more difficult than it needs to be, through trying too hard. You may not notice the things that make you happy because you’re too busy thinking about the things that don’t, or the things you don’t have that should. Time. Space. Opportunity knocks, but you have to be able to hear what’s at the door to be able to open it.